Start Hotspot Cloud WiFi Software is a robust and cost effective solution suitable for any hospitality deployment. This is centralized solution and all routers are connected to a central cloud server for authentication, accounting and management. Start Hotspot Cloud WiFi runs on Azure high-availability servers ensuring max uptime and database backup. Start Hotspot can be managed from any device, anywhere. 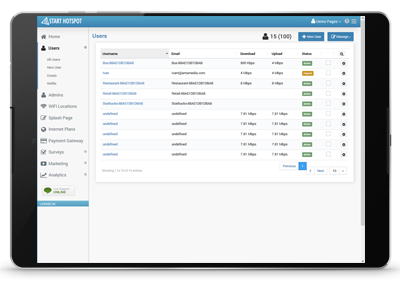 Our intuitive interface helps you configure users, wifi locations, splash pages, plans, access analytics or create new ads. You may create sub-admins for desired locations with partial access privileges to the management portal. User access tickets can be created and printed in bulk amounts with configurable Internet speeds. APs can be easily replaced with a spare one in case of any hardware error by changing associated MAC address.